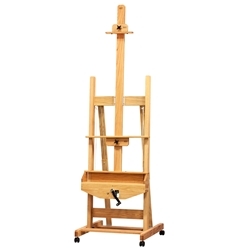 Best Crank Oak Studio Easel - A new design that raises and lowers by the turn of a crank. The easel stands 96-1/2 inches tall with the mast in its lowest position. The mast will lift with the bottom canvas tray when using the crank. The crank handle moves smoothly and quietly to easily raise or lower your painting. Holds canvasses up to 72 inches. Each BEST Easel is made of American oak, sanded to a smooth surface, then hand-rubbed with oil to reveal the inherent beuty of the wood grain. The craftsmen at BEST nail, glue, and wood screw every joint, guaranteeing strength and precision. Only the highest quality hardware is used as these easels are constructed to last a lifetime. This easel must be shipped by truck. The cost is a flat $99.00 shipping fee on this easel. We will pay the difference! This offer applies to all 48 contiguous States. Hawaii and Alaska as well as international destinations require a separate quote. Ships partially assembled.